When a home looks great, everyone enjoys spending time in every space. However, the process of completing renovating an old home to make it stand out requires patience, dedication, and drive. If you need help making your home grand, the strategies in this guide can help. Because kitchen cabinets are a focal point in a kitchen, you should begin a home renovation job by replacing your cabinets. Besides solid wood, the following cabinet materials can give a kitchen a grand vibe. ● Plywood: Plywood is a popular material that's made from multiple layers of thin wood. Each slab is secured together with industrial-grade glue; however, the wood grains are always visible. If you install new plywood cabinets in your kitchen, the laminated coating on the wood will shine. ● Wood veneer: A wood veneer is usually three mms, which is very thin. This material is commonly used to make modern cabinets because the slabs are strategically layered. If you want cabinets with grains that have character, a wood veneer option is worth considering. ● Particle board: Particle board has a combination of sawdust, wood shavings, and wood chips. As a result, it's a low-density option for designer cabinets. The particles are mainly featured inside of the board, and the outer portion has a solid layer that can be painted or stained. ● Linoleum: Linoleum is a very stylish wood that's made from multiple materials, such as ground cork dust, linseed oil, and wood flour. If your kitchen has many windows that let in natural light, linoleum flooring is a great choice because the pigments will glow as sunlight shines into the kitchen. ● Hardwood: Hardwood is another material that shines. This flooring option is available in many styles, cuts, species, and colors, and every slab has a unique grain pattern. ● Stone: A stone floor is constructed out of rock. You can use this material confidently in a busy kitchen because it has polished surfaces that don't scratch easily. ● Limestone: This is an upscale option that consists of high quality tiles. If you want to decorate your kitchen with colorful, dense flooring, you'll benefit from using limestone. ● Marble: Marble is made from metamorphic rock, which is a very elegant material. Although marble is expensive, it's a practical material for a grand design. ● Soapstone: Soapstone contains a variety of components. However, the main ingredient is mineral talc, which is very soft. Mineral talc doesn't make a soapstone slab weak because the soapstone formula also features a lot of quartz. The quartz gives a soapstone counter a hard, dense layer that's suitable for a grand kitchen. ● Quartz: A quartz counter top has five percent polymer resins and nearly 95 percent quartz. This engineered counter material has colors that provide flair in a kitchen. ● Wool: Wool is one of the most popular materials that designers use to make carpets. This material is luxurious, practical, and sustainable, and it doesn't require a lot of maintenance because the fibers don't hold stains. ● Polyester: Polyester is a soft material that's available in various colors. It's a great choice for high-traffic areas since the fibers are stain-resistant. ● Nylon: Nylon is an expensive carpet material that's very strong If you invest in nylon carpeting, everyone will have opportunities to walk on plush material that offers great support. Lighting is an important component that illuminates a grand design. If your home's entrance doesn't stand out, you can use solar lighting to enhance the surroundings. Great solar lights will highlight your home at night after the sun sets if they're mounted on both sides of your driveway. After your path is upgraded, you must take proper steps to enhance the lighting throughout the home. For example, if you want to impress guests as they enter your home, hang a ceiling fan with an elegant light fixture in the center of the main living space. 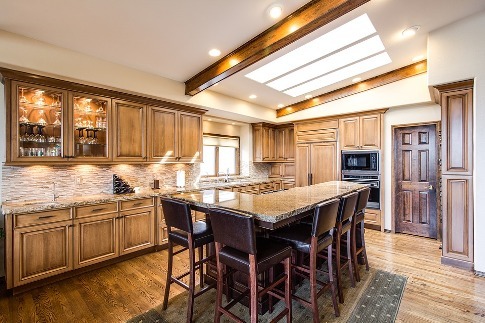 In order to make a kitchen more appealing, simply hang designer lights over the counters. Blinds and curtains can make a dull space stand out while reducing energy costs. Before investing in these products, you must measure your windows and take notes. The measurements are important because they will help you select blinds and curtains that will fit snugly on your wall. The final design components in a grand home are decorative items. When arranging decorations on shelves, always consider the overall theme of each space. If an environment has neutral colors, decorate the area with decorations that have a rustic color scheme. Bright decorative items work best on vibrant counters.